This section presents an overview of the climate change impact study on the Izmir-Tahtali basin groundwater system. 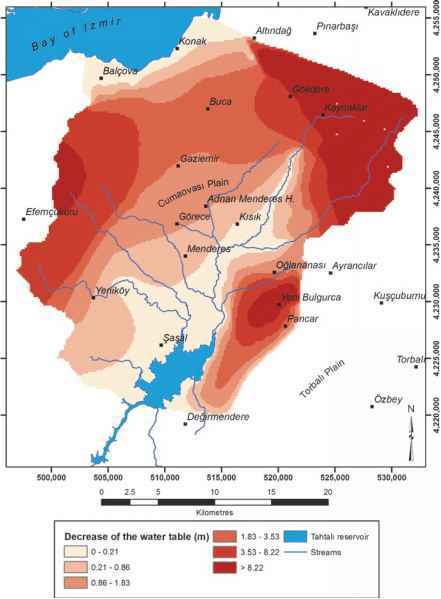 This study by Elgi and Fistikoglu  is the first published study of its kind performed for a basin in Turkey. The main goal of this study is to estimate climate change induced groundwater level and flow changes in the Izmir-Tahtali stream basin with a numerical groundwater flow model by considering the IPCC's SRES scenarios. The Tahtali dam reservoir was built on the Tahtali stream, which has a drainage area of 550 km2. It is a major water resource meeting 35-40% of Izmir's total drinking water demand. The Tahtali stream basin is a sub-basin of the larger Kuguk Menderes basin and receives an annual areal mean precipitation of 820 mm. The annual mean temperature in the area is 17.4°C. The general methodology of the impact modeling study is similar to previous studies in other parts of the world and consists of three stages. First, two scenario results of the HadCM3 model, the 20C3M scenario representing the current climate and the A1B scenario representing the future climate, were downscaled to the basin scale using the artificial neural network method. Historical time series of precipitation and temperature station records and the relevant NCEP/NCAR Re-analysis data were used in this process. 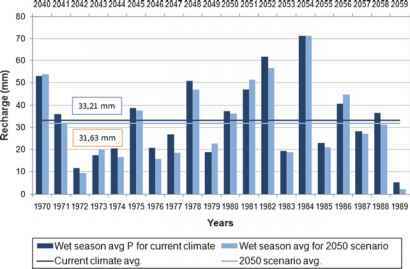 By comparing downscaled 20C3M and A1B projections, expected changes in precipitation and temperature monthly mean values were calculated for the period of 2040-2059, which is referred to as "2050 scenario" from here on. These changes are presented in Table 8.1. Projected changes in precipitation fluctuate on a monthly basis, however on an annual basis it is expected to decrease by 3.74%. Temperature is expected to rise for all months and the annual increase in calculated as 2.96°C. The next stage in the assessment process is to simulate groundwater recharge for the current climate and 2050 scenario. 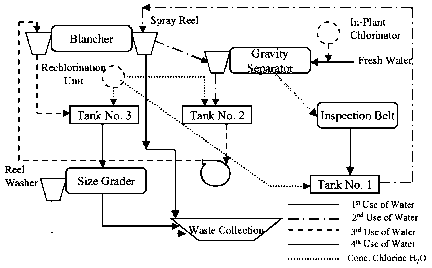 For this purpose, an independent, water budget based precipitation-runoff model was applied . The model uses monthly total precipitation and potential evapotranspiration (estimated from temperature data) to determine basin averaged surface and subsurface flow components, including groundwater recharge. 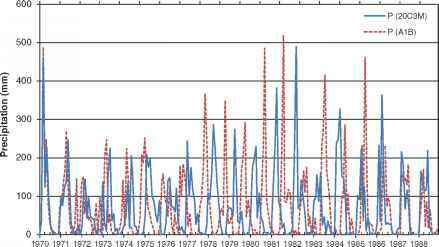 As input data for the model, future time series of precipitation and temperature valid for the period 2040-2059 were obtained by applying the changes in Table 8.1 on the observed time series for the period of 1970-1989. 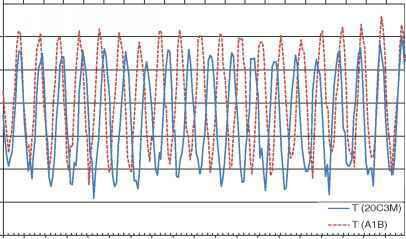 Time series for the current and future climates are shown in Figs. 8.1 and 8.2. Recharge estimates from the precipitation runoff model are presented in Fig. 8.3. Recharge values range from 5.1 to 71.1 mm for the current climate and the 20-year average recharge is 31.63 mm. For the 2040-2059 period, recharge is estimated to fluctuate in the range of 2.2-71.2 mm, with a 20-year average of 33.21 mm. It becomes clear that a future increase in precipitation and temperature translates into a 4.8% decrease in groundwater recharge. The final stage of the study is to run the groundwater flow model to obtain current and future water table depths and groundwater fluxes in the Tahtali basin. The groundwater system is simulated on a 150-m resolution finite-difference grid using the groundwater flow model MODFLOW-2000 . The model has one layer and is set up to simulate steady-state flow conditions of the wet season of the year. It receives recharge estimates from the precipitation-runoff model. Model properties, calibration and validation of the model are described in Elgi et al. .
decline everywhere in the model domain, where the magnitude of the decline depends on the hydraulic conductivity variation in the aquifer and the extent of surface-groundwater exchange at the Tahtali stream network. The water budget calculation results are summarized in Table 8.2. Based on these results it can be concluded that the largest component in the budget is and will be net groundwater recharge, which is predicted to decrease for the 2050 scenario causing a reduction of 29,062 m3/day in the water inflow to the system. Furthermore, spring discharge rates are predicted to decrease by 5.2%. Groundwater seepage to the Tahtali reservoir and Izmir bay is predicted to decrease by 2.4%. Another significant outcome of the water budget analysis is the change in the water interaction between the streams and the aquifer. For the current climate, streams gain 6,207.20 m3/day of water. The overall net direction of water flow is expected to reverse for the 2050 scenario, as the net loss of water from the streams is predicted to be 477.81 m3/day.